Rebel Legion :: View topic - Don Post X-wing helmet? Posted: Wed Jan 09, 2008 7:00 pm Post subject: Don Post X-wing helmet? 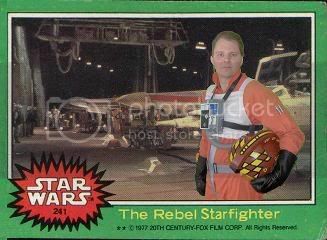 Just checking to be sure: Is Don Post's X-wing pilot helmet acceptable for the X-wing pilot costume, even though its size is smaller than the real thing? I can see it in the membership roster, but is it acceptable for new membership these days and for high-profile events? What mods have people done to make it more accurate, or more comfortable? However, we'll be revisiting the costume standards in the near future. My advice? Get yourself a helmet other than the Don Post/Rubie's. You'll be glad you did. Just for the record...you CAN have a Don Post/Rubies helmet and be acceptable. If you can find one go for the early Don Post ones. They are better. The helmets are too small however. Dreadnaught makes helmets, but they are too big. I would go for Richie's ones. I hear that WILCO makes them, but I have not personally seen one. If you want to wait until the end of next month a forth, better and cheaper one may be available. Shhhh.....it's a secret. If you can't wait....good luck and may the Force be with you. The Dreadnaught is the Wilco helmet. There was a name change / restructuring of operations as from what I was told. Alex and Bill (Dreadnaught and Wilco) have worked together for years. I think at one time they were doing different prop things, but I generally think of them as a "set". As Don mentioned, there will be another alternative for helmet kits if people can wait for the official announcement. Thanks for the clarification. So there are really only 3 helmet companies out there.....so far....that will change soon. Personally....I would wait. It will be worth it. That's what I am doing. Oh, and Alex of Dreadnaught Indisutries is currenty overseas I believe, which leaves Bill of Wilco Models to handle the helmets and such. I do know however that they are still in contact with one another (from reading threads on the RPF). I know who you are referring to. I am also eager to see it, even though I don't even need one. This week I have also seen a post on another forum from a guy in Australia who had vacuformed only a couple of helmets for himself and a few friends, and had one extra for sale. He had cast his own conversion of a real APH-6B helmet. The conversion had been performed with great attention to detail! I hope that he will offer kits for sale at a regular basis. Without giving too much away, will this new option offer finished painted helmets, or just blanks? I'm curious B/C I want to make my WIP pilot costume into a Luke one (even though EVERYONE in the RL seems to have that helmet design :p). Good question. I will have to ask. As much maligned the Rubies/Don Post helmets were/are, they really are the only option for people on a budget. The more accurate helmets looked better but unfortunately their makers knew it, only offering them for prices far out of competitive range. I wont say whether the price was unreasonable for the accuracy (not the record anyway), but fact is its too high for a lot of people. Simple as that. (Dont get me started on the prices of Richies other stuff, which I have found elsewhere for a quarter of the price). That being said, this 4th option will only be an option if the price is competitive. Whereas I would really like a size accurate helmet, anything over $90 is out of the question, accurate or not. (These are my priorities and simple prudence demands them). So can we drop more hints about the 4th option? I'd hate to get my hopes up for nothing. I got my helmet as a kit for $75. If you don't mind taking the time to put it together, plus do your own paint job, then it's a good deal. i've been wanting a helmet upgrade for some time so waiting a month or so is no biggie .can't wait to see them .